No one can predict objects falling from above. When we were kids, our teachers told us to put on our ‘thinking caps’. Now that we are all grown up, those who work in industrial settings need to use their thinking caps to remember to always wear head protection anytime hazards are present. The key to keeping yourself out of harm’s way is personal protective equipment, of all types. Hard hats play a very important role in protecting you. When a serious head injury happens, chances are the most cherished things in our lives - work, play, home and family - may be changed forever. In the beginning, hard hats weren’t very hard. The ED Bullard Company, a mining equipment manufacturer in California, generally is credited for producing the first US labour head protection. The ‘hardboiled hardhat’ was constructed from steamed canvas, glue, and black paint. In 1933, construction workers on the Golden Gate Bridge became the first labourers who were required to wear hard hats, due to concerns about falling rivets. Around 1938, aluminum became a standard for head protection except in electrical applications. Then in the 1940s, fiberglass became the popular material of hard hats. A decade later thermoplastics would take over because they were easy to mold and shape with applied heat. Today’s hard hats are made from a material called High-Density Polyethylene (HDPE) and a Type II hard hat is required to have a foam inner liner of Expanded Polystyrene (EPS), for extra safety and comfort. There are all types of hard hats available that are made up of various materials. One type of hard hat is the Skullgard hard hat, which features a heavy-duty fiberglass construction for use in steel mills and other heavy industries where high temperatures are common. In addition, most manufacturers discontinued production of aluminum hard hats years ago due to tougher ANSI safety regulations; however, there is one style of aluminum hard hat still available called the Skullbucket. Industries that utilise the aluminum hard hat include: US Forestry Service, logging industries, oil well firefighting, water well drilling, construction, boat building, crane/ heavy equipment operators, safety inspectors, and the demolition industry. Why wear a hard hat? In certain industries, such as construction, failing to wear a hard hat puts you at risk of serious injury, or even death. Hard hats contain an inner suspension, which provides approximately a 1 - 1 ¼ inch space between the shell and head. This space helps serve as a shock absorber in the event of an impact. Because this is an integral aspect of the design of the suspension and its effectiveness, it is important that the suspension fits properly. Hard hats protect the skull, and have the capability for furnishing extra protection by attaching face shields, to protect the soft tissueof eyes and ears. Most hard hats have slots to accommodate safety glasses, face shields, mounted lights, and/or earmuffs. Adding to the suspense - there are two choices of suspension used in hard hats: ratchet suspension features a quick ratchet-adjusting knob. You may turn the knob to tighten or loosen the hard hat, without removing it. Pin-lock suspensions adjust to the head with a locking mechanism, similar to a man’s belt. You must remove the hard hat to adjust this kind of suspension. Another point: typical hard hats have either a four-point suspension, or six-point suspension. This describes the actual number of clips that mount the cradle suspension to the shell of the hard hat. According to safety professionals, there is an unacceptably high rate of noncompliance in the workplace when it comes to wearing personal protective equipment such as hard hats. It’s not worth taking the chance of having a brain injury when one works in an occupation with such hazards. Could you imagine seeing a soldier on the battlefield without his helmet? Bicycle and motorcycle riders, race drivers and American football players all wear helmets, and baseball players wouldn’t dare step up to bat without their helmet on, while helmets are a very important part of a catcher’s gear. And, as a result of some serious ski accidents in the last few years, experts are also thinking that helmets may possibly save the lives of skiers. If the use of helmets is so prevalent in sport - whether that’s amateur or professional - it begs the reticence question where it comes to tough working environments. Class G - Hard hats that provide good impact protection but limited voltage protection. Best used for mining, building construction, shipbuilding, manufacturing, and lumber industries. Class E - Helmets that provide excellent protection for electrical workers because they protect against falling objects and high-voltage shock and burns. Class C - Lightweight comfort and important protection; they protect workers from bumping against fixed objects but do not protect against falling objects or electric shock. Hard hats are also described by what kind of impact protection they provide. Type I, which is a top impact hard hat, protects you from an object that may come from above, directly onto the top of the head. Type II hard hats are top and lateral impact, and do double duty by reducing the impact of an object that may hit the top or an off-center part of the head. Going back to putting on your ‘thinking cap’, according to the US Bureau of Labor Statistics, injuries to those workers not wearing hard hats may come from any angle. They report that more than one-half of the bare-head workers were bumped on the head while they were looking down. Almost three-tenths were looking straight ahead, and one-third of the unprotected workers were injured when they ran into stationary objects. So, keep your hard head up, and hard hat on! The standards of agencies of the U.S. Government, and organisations which are not agencies of the U.S. Government which are incorporated by reference in this part, have the same force and effect as other standards in this part. Only the mandatory provisions (e.g. provisions containing the word ‘shall’ or other mandatory language) of standards incorporated by reference are adopted as standards under the Occupational Safety and Health Act. We all know how important personal protective equipment is to help protect employees. However, there should be training on how to use it to be sure it fits properly and comfortably, and to ensure employees know how to take care of it. 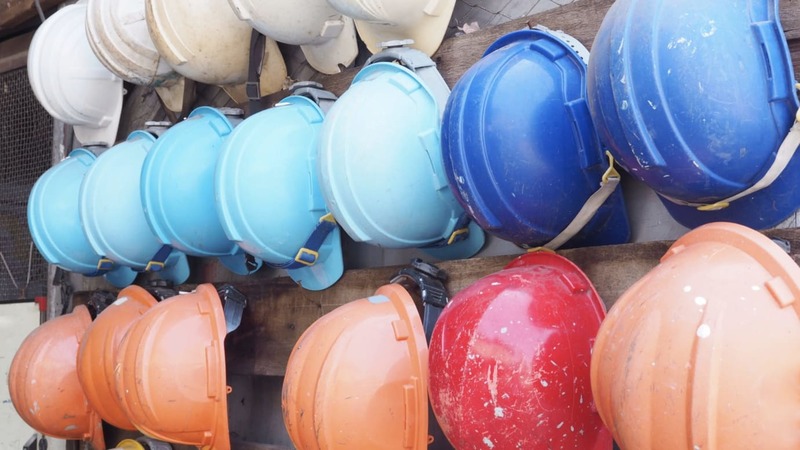 Companies should choose which type of hard hat matches the hazards involved in the particular job. It is to the benefit of employers to train their workers on taking care of their personal protective equipment. With regard to hard hats, they must be instructed to replace their hard hat when the shiny surface appears dull or chalky, if the shell becomes brittle, or if cracks appear in the shell. Suspensions may need to be replaced at least every 12 months. You’ll know if you need a fresh one if the suspension becomes brittle, it will no longer hold securely to the head, the cradling straps break or become worn, or one or more of the mounts break off. It is recommended that workers inspect their hard hats before and after each use. Manufacturers suggest replacement of the hard hat after no more than five years. It is also suggested to not remove the tag that is inside the hard hat in case there is an inspection. The service life of a hard hat starts when it is placed in use, not when it is manufactured. This date should be placed inside the helmet. Hard hats can be cleaned with simple soap and water, or by using a damp towel. The plastic suspensions can be cleaned in the same way. Some modern suspensions come with a sweatband in the front or back of the hat. They can also be gently washed by hand. By furnishing the proper protection for their workers, whether it’s gloves, safety glasses, safety shoes, protective clothing, hard hats, or any other PPE, employers are also protecting themselves. Prevention is much cheaper than the expenses incurred from workplace accidents and possible lawsuits. In addition to the possibility of receiving citations in the event that correct safety measures were not taken, lost time can be costly when accidents happen. Also, it is possible that insurance costs can increase. In construction and other industries where head injuries are possible, it is wise for employers to display signs or obstacles marked “Watch Your Head.” Safety meetings should involve all employees and stress that they wear their personal protective equipment at all times. Employees could be asked to list potential hazards that they have observed, as they are the ones on the front lines. The hard hat can only do so much to protect your noggin. You are responsible for your safety. You are responsible for keeping that protection on at all times in the work area. If you see a hard hat that has been damaged, think about what would have happened if that were a direct hit on your head. Maybe if a damaged hard hat were displayed at the workplace, workers would think twice about not wearing them. As stated earlier, OSHA recommends wearing the hard hat with the bill facing forward. Some hard hats have the unique feature to be worn backwards, because performing certain tasks require them to be worn that way, and are certified for that purpose. Otherwise, it is unsafe to wear a regular hard had backwards. One other type of head protection is called a bump cap, which adds protection to workers who do not require hard hats, but may incur minor bumps and bruises on the job. Bump caps are ideal for work areas such as food/beverage processing, meat packing, warehousing, auto repair, home inspection, various types of mechanical work, meter reading or pest control, where blows to back of head are not an issue. One type of bump cap is a ballpark-like cap that has a plastic liner and foam padding. Another style is composed of high-density polyethylene, with four-point adjustable plastic suspension system. These do not meet OSHA or ANSI standards. As mentioned earlier, hard hats have slots that various accessories can be attached to. For those working in hot climates, there are neck shields that protect the neck from the sun. Mesh covers are designed to add conspicuity to workers that may be slightly hidden. These covers have reflective strips on them, and fit all hard hats. Hard hats can also accommodate winter liners for those who work in cold climates. Hard hats used to be ‘plain Jane’, but no longer. Many companies require their employees to wear hard hats with company logos on them. Other employers have chosen team hard hats, such as - in America - National Football League, National Hockey League, National Basketball League, NASCAR, Major League Baseball, NCAA, and other teams for their workers - and they report that their workers love wearing them. For individuals who can select their own, there’s a plethora of fun hard hats that reflect each person’s unique personalities. For those who like attention, there’s the Undertaker (skull with burning eyes) or Flame. One that I like in particular is called Fly Boy, which features sharks’ teeth on the nose design of the P40 fighter planes of World War II. There are even pink hard hats for the girls in the crowd! And those who don’t find exactly what they are looking for, they can even have a hard hat customised. Also, there are welding hoods that will make sparks fly without even firing up the welder’s torch! Last, but not least, we Texans don’t want to overlook mentioning the hard hat designed for every true (or want-to-be) cowboy - the Cowboy or Western hard hat. Although they are OSHA Z89.1 and ANSI Z89.1 compliant, those workers who are subject to burn hazards may or may not be able to wear such a hat. If you are an employer, make the decision to protect your workers with the proper personal protective equipment, from head to toe. Hard hats have been around for a long time, and you know they will help protect your employees. They are not that expensive, and serve a very important purpose. If you are an individual, make the choice to wear that hard hat anytime you are on the job. It won’t help you if you leave it in your truck or on a table or bench somewhere. It is very important that you choose a hard hat that is comfortable and not too heavy. Persons may feel that the situation they work in is routine work, or not dangerous at all. But no one can predict when something heavy will fall from above. Remember Chicken Licken/Chicken Little? Don’t tempt fate - wear your hard had because, let’s face it, when he shouted “the sky is falling” it was merely an acorn! Texas America Safety Company has been serving the world with quality safety products since 1990. www.tasco-safety.com specialises in safety glasses, hard hats, work gloves, safety vests and other PPE products. The company is based in Brownwood, Texas USA and currently ships products throughout the United States and most other countries in the world. Pat Brownlee joined the Texas America Safety Company team in 2007 as a sales representative. She then began writing for the company safety blog ( www.Blog4Safety.com ) since it’s inception in 2009. These free articles provide useful safety tips over a wide variety of topics. Prior to that, Pat worked as an Administrative Assistant at a local hospital for five years, after working in a Special Services Cooperative office for five years. Her earlier career was an Office Manager for an oilfield construction company in West Texas for 17 years. She wishes to thank Doug Turner for his assistance in the pictures for the article.